Packing lunches for kids is a hot topic this time of year, and the reality is, it must be done! So wouldn’t it be nice to know how to make this dreaded chore easier? Well, you are in luck, my friends! Today’s post will give you the tools you need to make your wish come true. I used to loathe lunch-packing duty. Full disclosure: Four-letter words were sometimes heard in my kitchen after hours (i.e., after bedtime hours). I wanted to send a lunch made with love that would nourish yet not make me nutty. I mean, after finally getting four kids into bed, I really didn’t feel like cooking up a storm. No explanation required I’m sure. But I also didn’t want to resort to plain ol’ PB & J every day. Sure it could be a fall-back here and there, but couldn’t I get a little more creative? I did, in fact. I got creative with timing and trying new things. And I stopped cursing. (Well, I stopped cursing when it came to lunch packing.) And so, without further ado, here are some tips to help you have solid real food lunches, sealed with a kiss and not made after 9:00 pm. This is such a no-brainer, really. You spend time making dinner, so why not send it for lunch? Using what you have on hand helps you break out of the sandwich rut. This is a great way to add variety to your loved one’s lunches and cut down on prep work, not to mention thinking. Because really, how much work does it take to dish out and repackage a meal? This is not a new concept, but it has been such a life changer for me that I’ve actually written two eBooks about it. You know all of those great recipes you come across? Pin them, print them, or hold on to them however you can, and then actually make them. Double the recipes and make extras. Freeze the extras and have them on hand for instant throw-ins. Think waffles, pancakes, muffins, even soups. You can freeze taco meat, pulled pork, chili, and so much more! You wouldn’t think twice about purchasing frozen foods for the same purpose, assuming that the ingredient list lined up, would you? So why not make your own? It’s homemade, REAL convenience food. Made by you. It doesn’t get much sweeter than that. I used to be fearful of sending a new recipe or something totally different for lunch, because what if my kids wouldn’t eat it? As parents, we want our kids to be happy, and naturally we want them to have full bellies when they are away for a long day. But my personal opinion is, and you may not agree with me, if kids are hungry, they will eat. I have four kids, and yes, one of them is strong willed. And she’s my pickiest eater, by far. I try new foods and new dishes with all of them and send them in their lunches, and sometimes she (or the others) will come home with leftovers. And that’s okay! I don’t believe in “the clean plate club.” I believe in variety and trying new foods and adapting to things that are new and different. So yes, I will make a chana masala recipe and send it with rice. Or lentil soup, or green pea pesto. They may not love all of these dishes, but many times they do like them and are thankful for something different. In case you didn’t know, kids get bored too! Think fun shapes, colorful cards, or even just getting your kids involved in making lunch. I sent pancakes cut into strips one time as the “main meal” and my kids thought I was the coolest. Not keen on cutting your carrots into flower shapes? Not to worry. Stick in a fancy toothpick (I know you have some of those umbrella toothpicks lying around from your daiquiri drinks!) or pull out your cookie cutters. These are fun, creative tools that can easily kick up your game. Sajin (age 4) – “Raisins, applesauce, a plum, peppers, and pretzels.” We deduced that he likes a variety of little bits of food in his lunch. Hey, he’s 4 years old, maybe that’s what they like! Shaela (age 7) – “I like seeing things that I made in my lunch. I also like having a rainbow of foods in my lunch. And I like to make trail mixes and put them in.” When she references a rainbow, she really likes to have one red food, one orange, one yellow, etc. Deja (age 9) – “I like a mix of foods together” (For example, one time she had peeled clementines + blueberries. I think she likes the variety and color appeal.) “I like putting in things that I’ve made.” (This girl likes control.) :) She also said that she likes things to assemble at school. For instance, I’ll send salads but in one compartment she likes spinach, in another carrots, in another sunflower seeds, etc. She likes to put it together herself. Did I tell you she likes control? Sydney (age 10) – “I like fun toothpicks and when my sandwiches are cut into squares.” Lisa bought a sandwich cutter that’s likely geared toward toddlers, but who knew her daughters would think it was the coolest thing for sandwiches since sliced bread? Sienna (age 8) – “I like a lot of fruit and salad for my vegetable.” She’s not a big fan of carrots or other typical veggies, but Lisa always knows a good salad will be a winner with her! Be sure to ask your crew what they like in their lunch and share their tips, or yours, with us in the comments below. We always love new ideas! Oh, and for those times when you know you won’t be able to shop for or make lunches, you should check out The Good Kitchen, which offers paleo-friendly, organic, and non-GMO lunches delivered to your door. Try it out with code 100 DAYS and save $17! 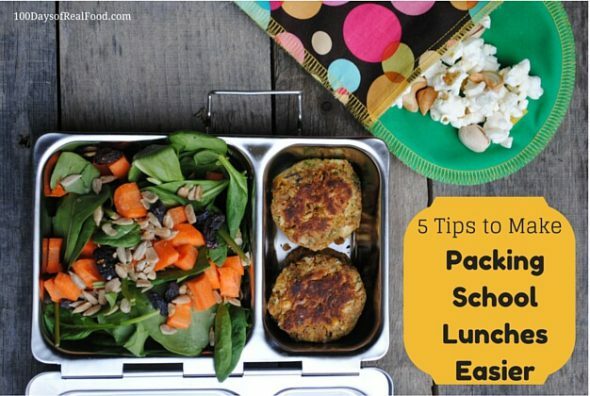 Previous Post: « 5 Ways to Pack Breakfast for Lunch! I would love some suggestions for lunches for high schoolers :) I have one that’s a junior and another who’s a senior. Their lunches are typically pasta ragu or roasted sweet potatoes + chicken or stir fried rice (or noodles) or protein + toasted bread, all with some form of snack (fruits or homebaked cookies). That sort of thing. But I’m getting tired of these options and I’m quite certain so too my children, and the new school year has only just begun – help!! I would love to see some meals for high schoolers as well! I have a girl who is a senior. By HS, they ought to be capable of making their own lunches from the healthy options on hand. This is a great way to train them to exercise the independence that they’ll need once they hit college. My daughter was fully in charge of her own lunches by the time she hit the eighth grade. That is a very valid point. However, our family works a little differently :) we teach them how to cook/recipes over the weekend so that they are prepped for life in university but on weekdays/school days, we take care of their meals so they can focus on other things. When mine were in high school, they were big fans of pasta, basil pesto, and something. Really, that’s how lunches got made, I would make a batch of basil pesto and put it in the fridge, put containers of cooked pasta in there as well, and I made sure that there were cubes of leftover roast chicken, pork, hardboiled eggs and cheese in the fridge as well. They would get a plastic container, put some pasta in, add pesto, meat, cheese or both, eggs sometimes, sometimes some pine nuts or some other kind of nuts and there we were–lunch. If I made salads and put them in small plastic containers, they would take one of those as well. To boil it down, if it was in the fridge and easy to grab and go, they would do so. If they had to make it, they’d pass. Oh, yes, me too! I have a 6th and 8th grader with adult taste. They get on the school bus at 6 am, so I make lunch and they make breakfast. I would love some ideas for them. I hear your requests!! Maybe the next product should be focused on teens/highschoolers;). Love the feedback! I roast two pounds of chicken thighs and/or make a pound of taco meat with hamburger, make a batch of refried beans and shred some cheese. I get two packages of flour tortillas and fill them with these ingredients, wrap them individually and put them in a big Ziploc bag in the freezer. My boys love to pull one out the night before and use it for lunch or an after school snack. They’re a big hit, filling, full of protein and fiber. Winner! Such a great idea. There is nothing better than wondering what to pack and remembering that your freezer is stocked with foods to grab and go. Good for you! I, too, have a high-school-er who takes lunch every day and I’d love suggestions for his lunches. I love the Yumboxes Lisa recommends, but I find that they are just too small now and don’t hold enough food for his appetite. Any suggestion for water-tight lunch boxes that are more “adult” sized. 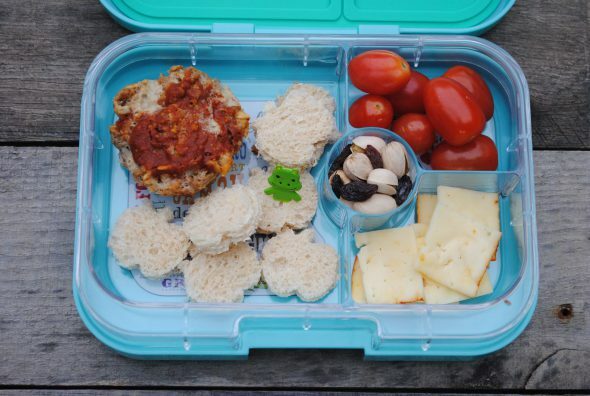 Have you seen our lunchbox review (https://www.100daysofrealfood.com/2015/08/07/review-favorite-lunchboxes-for-kids/)? The PlanetBox listed within would be a great option as would LunchBots. You can read more in the link above. Thanks Breanna! Love that you pack for yourself … and I also agree that color makes it all the much more appealing;). Don’t kids mind eating cold lunch that’s normally warm? If I made chicken and rice for dinner, I can’t imagine packing that for lunch. Same with pulling food from the freezer. This is why I always give sandwiches. We have had success keeping the leftovers warm with a good thermos. I agree with both previous posters. You either get used to eating foods cold (my kids never care) or you can use a good thermos. It may not be *hot*, but it’s certainly still warm. I would love to see a few dinners for high schoolers also! I have a young lady who is a senior. Lisa has posted about freezing certain foods to make packing lunches easier. Does she have a post with freezing information? Like how she freezes the muffins, soups, pastas, etc. I’m sure many of us would like to know what she uses to store the foods in while in the freezer. Has anyone made the granola bars from the first edition of the e-books? With cocoa and oats? Mine turned out very crumbly. They taste fine but there no way these are gonna be “bars”. I used almond butter instead of PB? Would that make difference? WaoooW… Nice Ideas. This will help me packing my kids lunch. I think this is the time to do something new and creative as a mom. The struggle that I’m finding with foods I make ahead and freeze or leftovers is that my children have no way of heating these meals up. Any fabulous suggestions for that. I do know I saw a blog on a soup thermal, but anything other than that?? Can you defrost the foods the night before and heat them in the morning for them? And then use a thermos? Looks quite helpful for me.. as i was looking for such types of ideas which helps me to pack my Lil Bros Lunch conveniently .. Thanks for sharing such a helpful resource..!! That is an extremely substantial point. Nonetheless, our family works a little diversely :) we show them how to cook/formulas throughout the weekend with the goal that they are prepared for life in college yet on weekdays/school days, we deal with their dinners so they can concentrate on different things.. Very nice tips.. @admin…. As it helps many peoples n me too..as always gt troubles while packing my kids Lunchboxes..!! thanks for sharing such a helpful resource ..!! I’m very lazy about packing lunches. But I think these tips helps me to come out from my laziness. I tried this and my kid cried….it’s so tough to get your kids to eat healthy but I know I need to get my kid on the right track and used to this kind of eating…any more tips? Hi there. This will help: https://www.100daysofrealfood.com/?s=picky++eaters.